Noodles, Tea, and a Didi Please! Looking grown up, adorable, and all dolled up for a birthday party! I'll be the first homeschooling mom to admit I have help. Grant is a great teacher! I'm sure Jake will be a champ at chess in no time! Eric and I headed to the gym despite the snow and then an emergency trip to the grocery store for hot chocolate and marshmallows. Of course, sledding was next!! We haven't had real snow since we moved to the Portland area so this is a real "treat". Kids are happy to play; husband is looking forward to the extra business. I'm warm in the house walking in circles trying to earn my 10,000 steps! Nothing like throwing your hat into the ring (or your children's hats) for a major competition for a first tournament. But, that's just what we did. 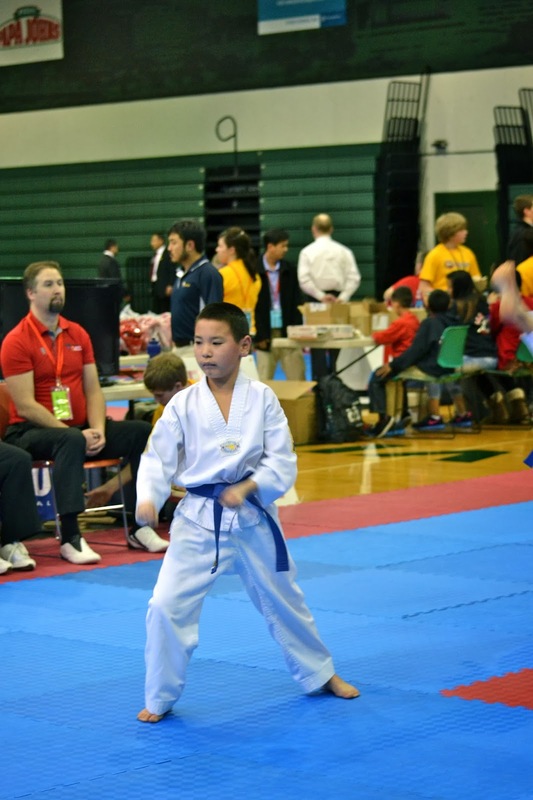 The boys have been working hard at TKD 6 days a week and have never competed in a tournament until this past weekend. They both competed for the state championship which was a the qualifier to go to nationals which will go on to World's. It was a biggie. You learn a lot really quickly this way like the extra bow to the judges--point off! There were lots of little things and honestly it probably wasn't the best tournament to try. However, Jake came away with a gold medal and can now go to nationals this summer AND YET- wait for it- he didn't spar a single competitor! Only Jake, right? There was no one in his weight division to spar. Mr. Featherweight thought winning gold was great and is still telling everyone! Yep, there have been some discussion about earning wins. But, he's happy. Grant sparred and scored but his competitor was winning by a point when the boy broke his toe with 7 seconds left in round 2. He toughed it out but Grant didn't get all of the 7 seconds in the round and lost. Honestly, I think he was a little afraid to kick the guy after that. Who wants to kick the guy that's down? All in all, our boys have some experience now under their blue belts in poomsae and sparring competition. They also walked away knowing that they have worked hard for several months and can hold their heads high. They aimed big and were the newbies out on the mats. Chalking it up to character lessons learned! My sweet boys have donned aprons and baked some blueberry muffins for me this morning. Complete with some spicy chai and milk! Allygirl requested bangs at her hair appointment today. I think she looks adorable, but the boys told her that she looks younger. I'm sure that's not what she wanted to hear. However, I'm all for it if it's possible to make my teenager look younger!! Jake to Ally as she was playing around with his beyblade: "you are not worthy to launch the bay because you are not Asian!" Jake has been taking a science class on God's creation which includes him! He was so very excited to show me his finished skeleton. He's been talking about it for weeks. Speaking of talking, he's been doing a lot of that to his co-op teachers. Today he told her that he had gone to China for 2 days and walked 5,000 miles on the Great Wall! (We were absent last week due to my foot). Oh my! That's a whopper! Yes, that's the girl walking into school wearing...wait for it....a dress!! Wahoo!! She looks beautiful too, but I had to take the picture incognito. Anyone familiar with teenage girls understands that. Jakeism for the day: While doing addition with 2 carry numbers, he said, "Wow! I am really moving up a league!". Jake is reading a story about a crow. He read a similar story in another book. He said, "I read this but I think that was season 1 and this is season 2". He cracks me up. It's kinda sad when you're only posting pics of a foot or toe! These four walls of my home seem to be closing in on me. I haven't made the progress I'd like, but progress nonetheless! I didn't scream or push Eric away with yesterday's dressing change. My toe incision is looking better and better with less drainage. At least we've gotten a whole lot done in our schooling and on a much slower pace! The ole boys are "all in" when it comes to playing poker. I think Jake has no idea what he's doing but he does enjoy talking smack! I'm still working on getting rid of an infection post-op so it looks like school will resume tomorrow in my bedroom or the couch. I don't think the boys will mind one bit!